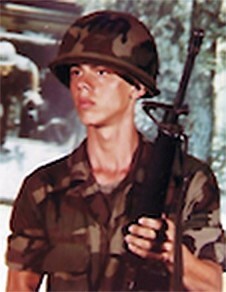 Robert Eugene Gound II upon graduation from the U.S. Army Ranger Sniper School, circa 1985. He is the brother of Dorene Soiret, Participant No. 52 in DNA Consultants’ Cherokee DNA Studies, Phase III, and bears the same copy of “anomalous Cherokee” mitochondrial DNA they received from their mother, Alice Gound. Photo used by permission of Robert Eugene Gound II. Phase III of DNA Consultants’ Cherokee DNA Studies has been closed to enrollment, the company announced May 25. The additional 57 participants’ mitochondrial DNA records mark the end of an eleven-year house study to find out why certain Cherokee descendants do not have “official” American Indian genetic types showing Native American ancestry. Consolidated findings will be published by the company’s Panther’s Lodge Publishers subsidiary in the fourth of the Series on Consumer Genetics by year’s end in a follow-up volume titled Cherokee DNA Studies: More Real People Who Proved the Geneticists Wrong. Phases I-II were capped by the publication of a groundbreaking and iconoclastic book on Cherokee history by Donald N. Yates and Teresa A. Yates, published by Panther’s Lodge as Cherokee DNA Studies: Real People Who Proved the Geneticists Wrong (DNA Consultants Series on Consumer Genetics 1, November 2014). There were 52 participants in Phase I, 67 in Phase II and 57 in Phase III, making a total of 176 persons in the entire mitochondrial sample. Robert E. Gound II (photo) was chosen as our representative “anomalous Cherokee.” He and his sister Dorene were both born in Southern California, but when he moved to Kentucky one of his sons became friends with an Adkins in grade school, not realizing they were Cherokee relatives upon their first meeting. They are close friends to this day. As shown in the study, the siblings descend from pioneer William Vortimer Adkins (1689-1754) and have Cherokee Attakullakulla (1708-1777) and Chief Peter Cornstalk in their family tree. Their Indian ancestry is composed of intertwined Cherokee, Shawnee and Powhatan lines. In intermarriages, it includes such famous early Jewish and Crypto-Jewish figures as Maria Horsmanden (also married a Byrd), Nancy Moytoy, Lady Susan P. Jeffery, Richard Parker, James Drake, Catherine Van der Poel, Elizabeth See and Moses Deed Damron.